Interchangeable Test Adapter (ITA) provides interconnect between National Instruments (NI) PXI test cabinet to custom load box interface. 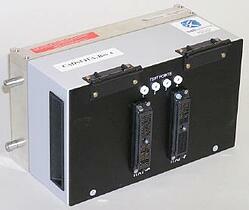 Project involved custom design of ITA wiring interface, custom cable harnesses, and load box. Also, PXI cabinet design and assembly, and low-volume manufacturing of complete systems.